Sassoferrato (1609-1685), The Virgin in Prayer (1640-50), oil on canvas, 73 x 57.7 cm, The National Gallery (Bequeathed by Richard Simmons, 1846), London. Courtesy of and © The National Gallery, London. Of all the pigments used in European and Western painting, Ultramarine Blue remains the queen. Originally made by crushing and grinding the semi-precious stone lapis lazuli, its cost has exceeded that of gold. Seen in paintings, it produces a rich slightly reddish blue which stands the test of time, as distinctive and effective today as when it was first used. And its use has unmasked fakes and forgeries. Artist not known, wall paintings by the Buddahs of Bamiyan, Afghanistan, c 507-554 CE. Image by Carl Montgomery, via Wikimedia Commons. The sole source of lapis lazuli in Europe and the West were quarries in Badakshan, described by Marco Polo and now in Afghanistan. 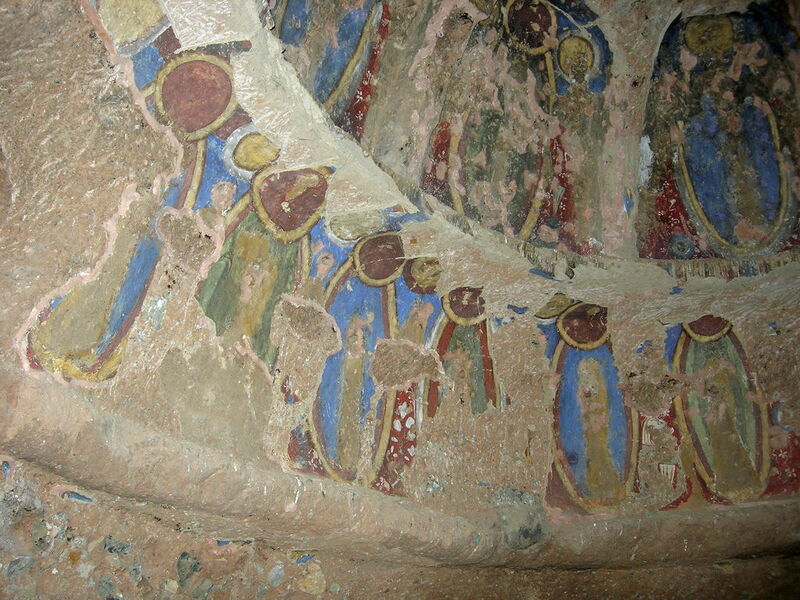 It appears that wall paintings made around 507-554 CE adjacent to the great Buddahs of Bamiyan were the first to have used the mineral as a pigment. It was then used in early Persian miniatures, and in early Chinese and Indian paintings too. The powdered pigment had made its way, first along the Silk Road, then by sea, to traders in Venice by about 1300. By the Renaissance, it was established as one of the most important and precious of all the pigments used in European art. 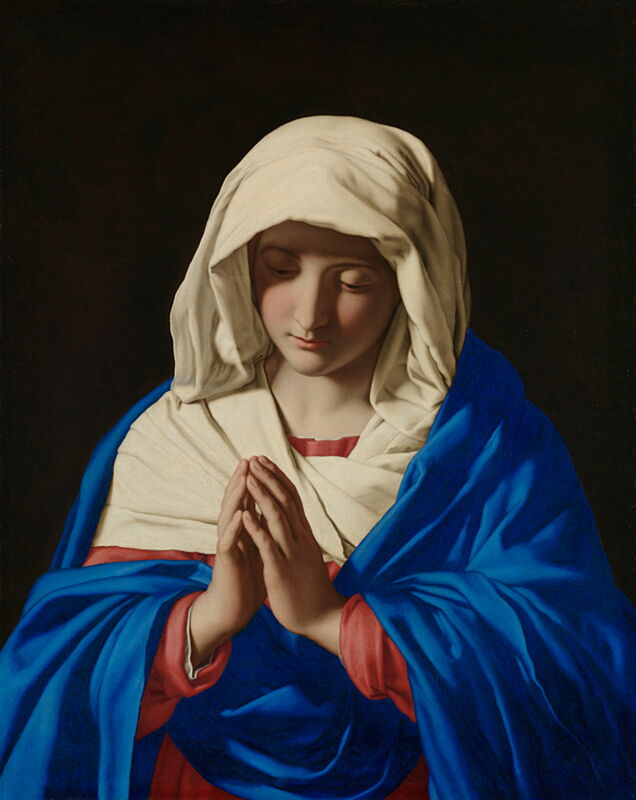 Because of its beauty and high cost, Ultramarine Blue was used for the robes of Jesus Christ and the Virgin Mary. 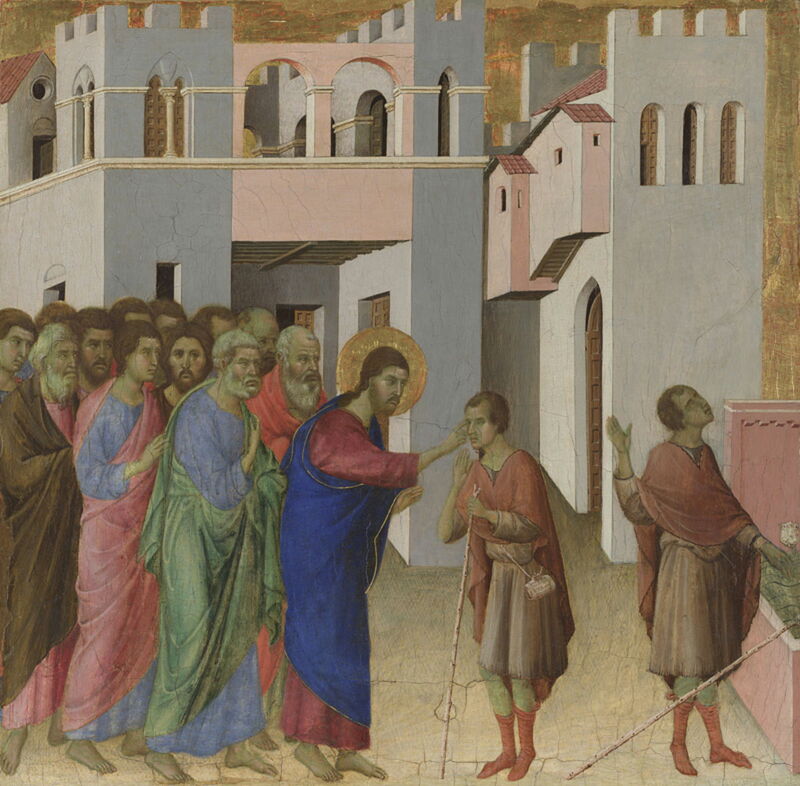 Duccio’s panels from the Maestà Predella, including this of The Healing of the Man born Blind, show this tradition in its earliest years, around 1307-11. As a pigment, it proved practical in egg tempera (as here), oils, watercolour, and fresco. 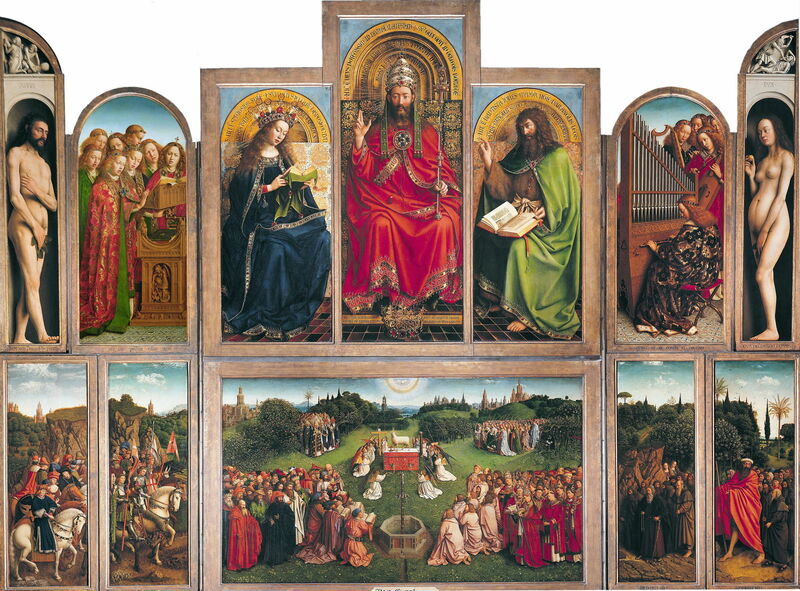 Ultramarine Blue has been found in the van Eyck brothers’ Ghent Altarpiece from about 1432 (above), and particularly in its most famous panel, known as The Mystic Lamb (below). Sandro Botticelli (c 1445-1510) and Filippino Lippi (c 1457-1504), Adoration of the Kings (c 1470), tempera on wood, 50.2 x 135.9 cm, The National Gallery (Bought, 1857), London. Sandro Botticelli’s early tempera on panel painting Adoration of the Kings from about 1470 (made with Filippino Lippi, apparently) shows two different blue colours and purple. He painted the purple with an opaque underpainting of Lead White tinted with a Red Lake derived from Madder, to create pink. That was then glazed with quite coarse particles of Ultramarine Blue, so the pigment was thinly dispersed. 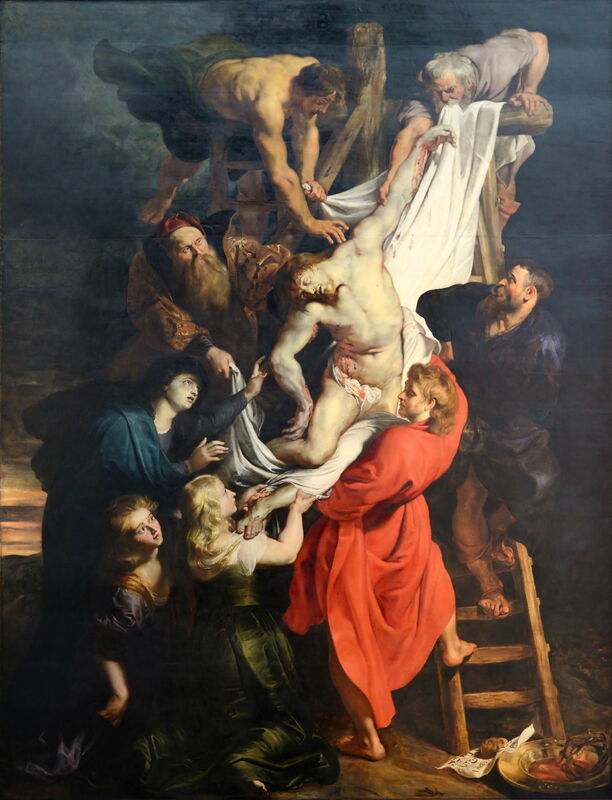 Peter Paul Rubens used Ultramarine Blue quite widely in his magnificent triptych now in Antwerp Cathedral. In its centre panel, Descent from the Cross (1612-14), it has been found to have been combined with Indigo and other pigments. Anthony van Dyck (1599-1641), Charity (1627-8), oil on oak, 148.2 x 107.5 cm, The National Gallery (Bought, 1984), London. Courtesy of and © The National Gallery, London. In van Dyck’s Charity from 1627-8, its most obvious use is in the blue cape, where Ultramarine Blue was painted over Indigo, applied as both a tint and a glaze over the top. Visit any of the larger galleries with substantial collections of paintings made before 1700, and you will see works with drapery which I can only describe as arresting in the brilliance of their Ultramarine Blue. One stunning example in the National Gallery in London is Sassoferrato’s The Virgin in Prayer from 1640-50. The Virgin’s cloak looks as if it was painted only yesterday, and that colour makes you stop in your tracks and draws you into the painting, like no other pigment can. Given its importance, and limited supply, considerable effort was devoted to ensuring that natural Ultramarine Blue was of the highest quality, and alternative sources were sought. Deposits in the Chilean Andes, and near Lake Baikal in Siberia, were not opened up until the nineteenth century, and attempts to make synthetic Ultramarine were unsuccessful until 1828, when Jean Baptiste Guimet was awarded a prize of six thousand francs for his discovery. Almost simultaneously, C G Gmelin of Tübingen discovered a slightly different method. Commercial production had started by 1830, and it became known as French Ultramarine, to distinguish it from the natural pigment. Although almost identical in colour and performance, there are significant differences between natural and synthetic Ultramarine when tested in the laboratory. This has enabled the examination of paintings to determine the source of their pigment, and has brought some surprises. These most often relate to later overpainting during restoration. 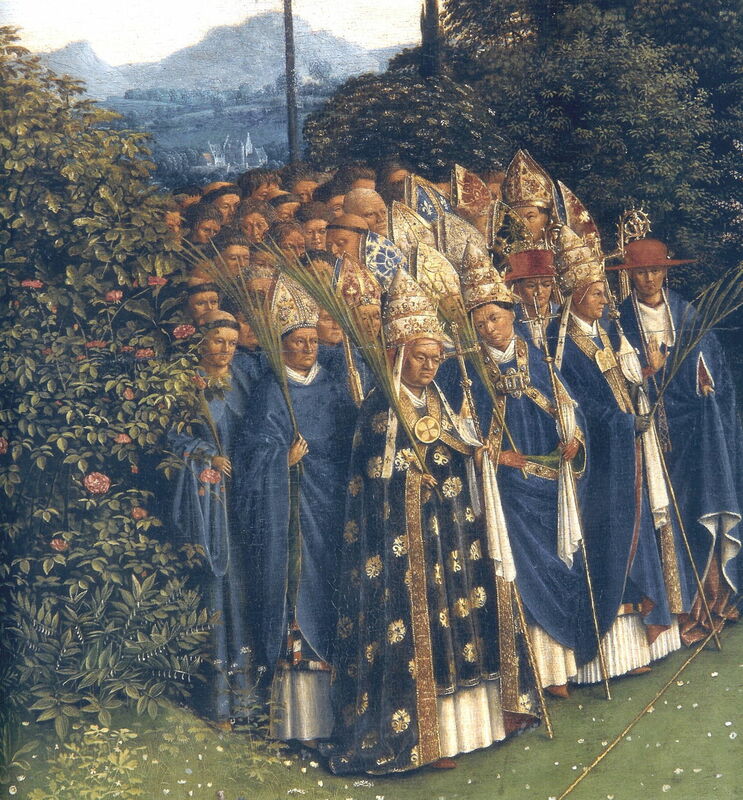 For example, two areas of much later painting have been discovered in the van Eycks’ Ghent Altarpiece. Édouard Manet (1832-1883), Corner of a Café-Concert (1878-80), oil on canvas, 97.1 x 77.5 cm, The National Gallery (Bought, Courtauld Fund, 1924), London. Courtesy of and © The National Gallery, London. 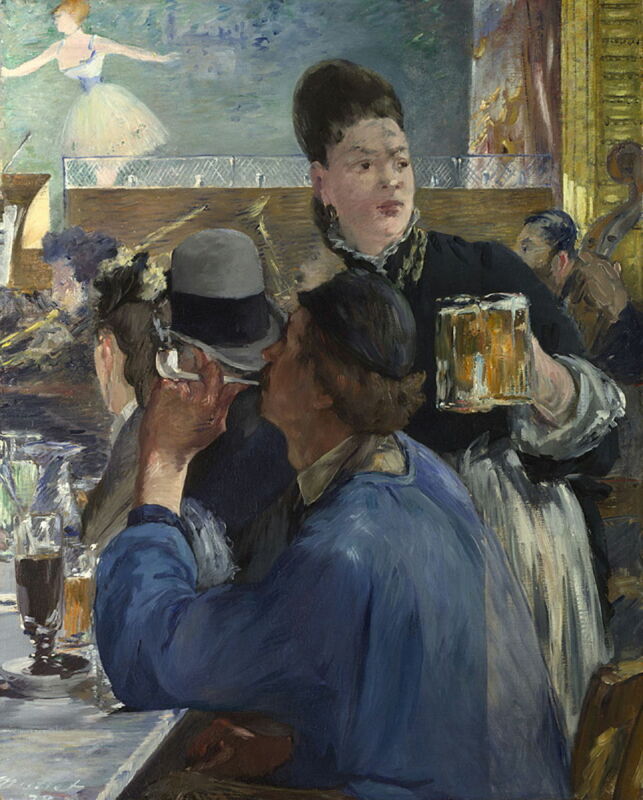 Examination of Édouard Manet’s Corner of a Café-Concert, from 1878-80, has shown that he used synthetic Ultramarine in its blue passages, for example. 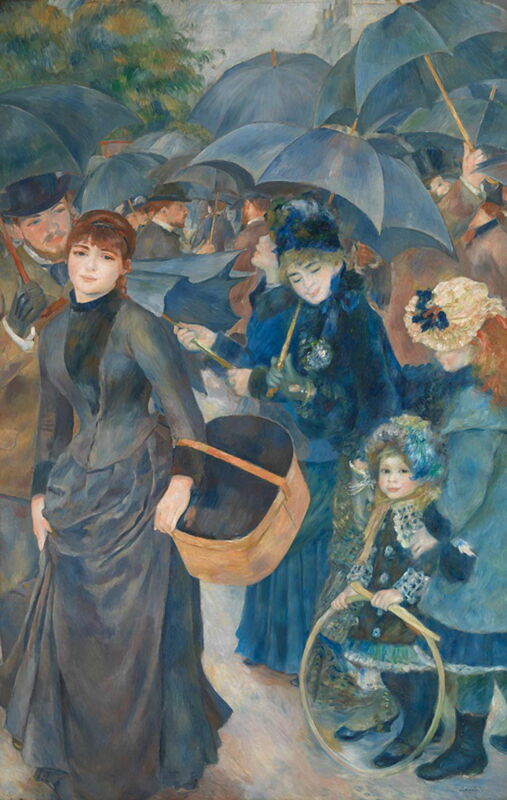 Pierre-Auguste Renoir’s The Umbrellas, from about 1881-86, uses synthetic Ultramarine in a very methodical fashion. The first stage in its painting used only Cobalt Blue, but in its second stage synthetic Ultramarine was applied extensively. Vincent van Gogh (1853-1890), A Wheatfield, with Cypresses (1889), oil on canvas, 72.1 × 90.9 cm, The National Gallery (Bought, Courtauld Fund, 1923), London. Courtesy of and © The National Gallery, London. 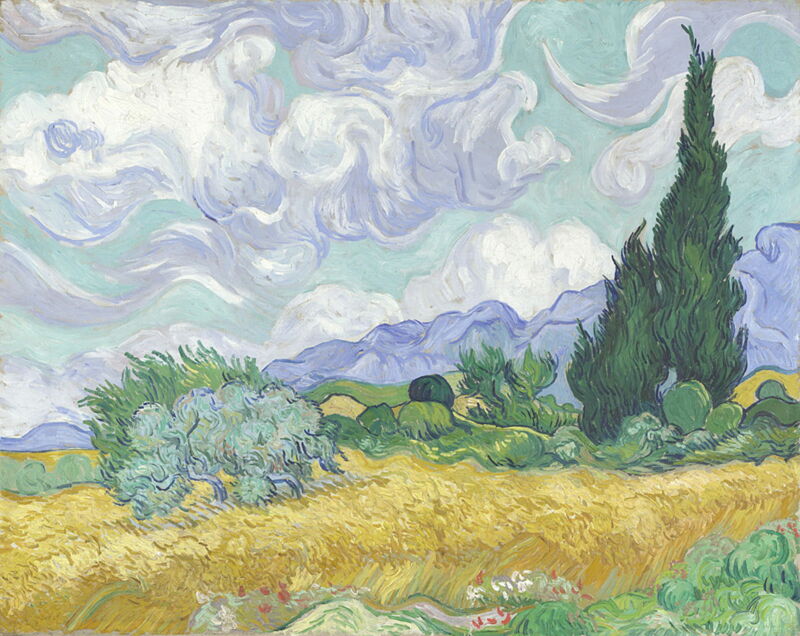 Vincent van Gogh’s A Wheatfield, with Cypresses (1889) contains synthetic Ultramarine in its deepest blues, and in some areas of green. It is unusual to find Ultramarine mixed to form green. Before synthetic pigment became available, this would have been far too expensive a way of making any significant amount of green, but once much cheaper pigment came onto the market, that became more feasible, if still unusual. The ability to distinguish synthetic Ultramarine, which did not exist before about 1828, and the natural pigment has proved important in detecting some forgeries. Only the most ignorant would attempt to pass off a painting made with synthetic Ultramarine as being very old, but a few fakes fell at that hurdle. 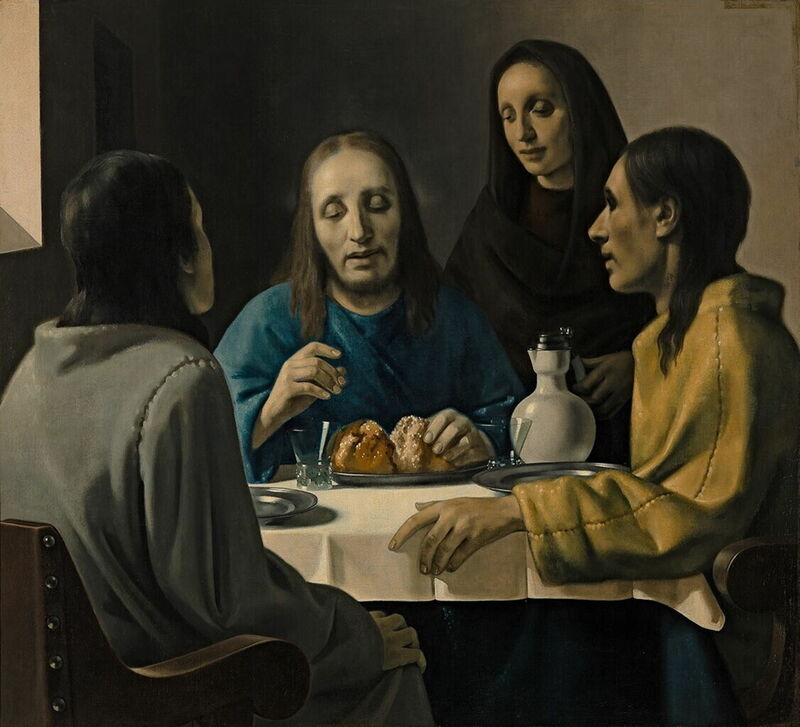 Han van Meegeren (1889–1947), The Men at Emmaus (1937), oil on canvas, dimensions not known, Museum Boijmans Van Beuningen, Rotterdam, The Netherlands. Wikimedia Commons. Han van Meegeren was far too knowledgeable and cunning to be caught so easily. He used natural Ultramarine, for example when he sold The Men at Emmaus (1937) to the Museum Boijmans Van Beuningen as a Vermeer. What no one knew at the time was that his Ultramarine looked genuine, but had been contamined with a small amount of Cobalt Blue, which wasn’t discovered until 1803-04, and was first used as a pigment in 1806. In 1960, the modern artist Yves Klein worked with a paint supplier, Edouard Adam, to ‘invent’ a paint which he termed International Klein Blue (IKB). Although its formulation is a secret, it is almost entirely synthetic Ultramarine Blue pigment in a polyvinyl acetate binder. Like all the best queens, Ultramarine Blue has an unnerving habit of revealing the truth. Joyce Plesters (1993) Artists’ Pigments, vol 2, ed Ashok Roy, Archetype. ISBN 978 1 904982 75 3. Posted in General, Life, Painting, Technology and tagged artists paints, Botticelli, Duccio, history of painting, Klein, Lippi, Manet, painting, pigments, Renoir, Rubens, Sassoferrato, van Dyck, van Eyck, van Gogh, van Meegeren. Bookmark the permalink.